In between my more in-depth paintings I am trying to sneak in some smaller, or simpler ones. I painted this old blue bottle recently on an 8 x 8 art-board surface and hope to list it in my Etsy shop soon. The bottle has a lot of character, it is a little misshapen, is crackled throughout, and is an incredible blue color. I really liked the way the blue created a tinted shadow on the cloth background. 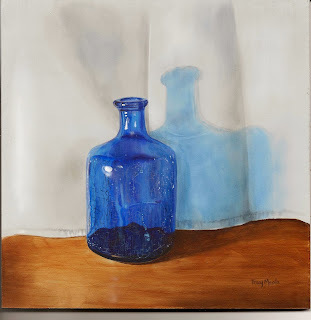 It is always fun to create the background that is behind the bottle (or through the bottle) because it is a slightly different color and the shape changes behind the glass. When I set up a still-life I usually leave the folds that are in any of the cloths that I use because they add some interest to the painting (so why take the time to iron haha).